SongwriterUniverse & SingerUniverse founder Dale Kawashima has an extensive background as President of major music publishing companies, as a label A&R Executive, as an Independent Music Publisher, and as a Music Critic/Journalist/Editor. He has enjoyed success in the pop, rock, R&B and country fields. In addition to discovering and developing new talent as an A&R exec, Kawashima as a music publisher has supervised and represented many of the world’s top catalogs, including the songs of the Beatles, Bruce Springsteen, Bob Dylan, Prince, Michael Jackson, Stevie Wonder, Holland-Dozier-Holland, Little Richard, Burt Bacharach & Carole Bayer Sager, and Billy Steinberg & Tom Kelly. He has worked as an executive at Sony/ATV Music Publishing, Irving Azoff’s Giant Records, Mercury Records, and Jobete Music (the publishing division of Motown Records). Currently (in 2018), Kawashima is involved with several projects. First, Kawashima continues to oversee all activities and content for SongwriterUniverse and SingerUniverse, which are popular, online music magazines which attract an impressive 100,000 unique visitors and 295,000 page views per month. Second, Kawashima is an A&R Consultant who helps develop young artists and songwriters, and third, Kawashima runs his independent music publishing company, Dale Kawashima Music. Kawashima began his career as a Pop Music Reviewer while attending college at U.C.L.A. He wrote album reviews in the Calendar section of the Los Angeles Times (edited by Robert Hilburn) and for other publications (including Melody Maker in England). Upon graduating from U.C.L.A., he became a Staff Writer/Review Editor for Cash Box Magazine for a year, reviewing both albums and singles, plus interviewing in-person such luminaries as The Who, Peter Gabriel, Andrew Lloyd Webber, the Beach Boys and the Clash. After Cash Box, Kawashima began his career in music publishing as Professional Manager at Jobete Music (the classic Motown catalog). In addition to supervising the works of new songwriters, he promoted and secured cover records of many classic Motown songs, including Kim Carnes’ cover of Smokey Robinson’s “More Love,” which was a Top 10 pop hit. Dale Kawashima with Michael Jackson. After two-and-a-half years at Jobete, Kawashima left to launch his independent publishing company, Dale Kawashima Music. During his six years as an independent publisher, he built his own catalog, which included a hit (“I Need You”) from the Pointer Sisters quadruple platinum album, Break Out, and the song “Smile” from the platinum Gap Band V album. However, Kawashima’s main success was as a “songplugger” for the catalogs of Prince, Bruce Springsteen, Bob Dylan, Burt Bacharach & Carole Bayer Sager, Ray Parker Jr., and Billy Steinberg & Tom Kelly. His biggest hits were: “I Feel For You” by Chaka Khan (a worldwide #1 hit which received two Grammy Awards): “Mr. Telephone Man” by New Edition (a Top 10 Pop and #1 R&B hit); “Do Me Baby” by Melisa Morgan (a #1 R&B hit which helped make this Prince song a R&B standard); “How Come U Don’t Call Me Anymore” by Stephanie Mills (a Top 10 R&B hit); “I Don’t Want To Lose Your Love” by Crystal Gayle (a #2 country hit); “Stand On It” by Mel McDaniel (a Top 15 country hit which was the first country hit for Bruce Springsteen); “I’ll Be Your Baby Tonight” by Judy Rodman (a top 10 country hit); and “When U Were Mine” by Cyndi Lauper (from her six-times platinum album, She’s So Unusual). 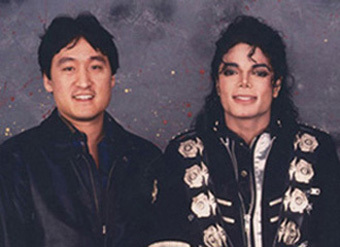 It was Kawashima’s success as an independent publisher which led to receiving an offer from Michael Jackson to become President of ATV Music. During his four-and-a-half years at ATV, Kawashima managed and promoted Jackson’s great publishing holdings, which included the catalogs of the Beatles, Michael Jackson, Little Richard, Sly Stone, Barry Mann & Cynthia Weil, and many other hits. It was during this period that ATV enjoyed such major hits as: Linda Ronstadt & Aaron Neville (“Don’t Know Much”); Anita Baker (“No One In The World”); Karyn White (“The Way I Feel About You”); the Simpsons (“Do The Bartman”); several country hits by the Judds (including “Why Not Me”); plus Top 10 country hits by the Rosanne Cash and Sweethearts Of The Rodeo. Also, rap sampling use of the Sly Stone catalog generated great publishing royalties for the company. During Kawashima’s years at ATV, the overall value of ATV Music continued to grow substantially. 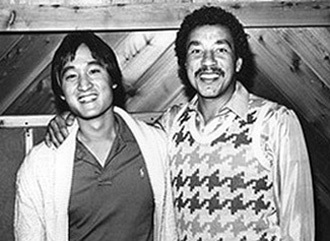 Dale Kawashima with Smokey Robinson. Following his years with ATV, Kawashima left to become President of the publishing division of Irving Azoff’s Giant Records. Working at Giant allowed Kawashima a greater opportunity to sign and develop new musical talent (instead of focusing on catalogs). Under his direction, Giant Music published the rock group Big Head Todd & The Monsters (whose debut album went platinum) and Warren Zevon (his Mr. Bad Example album). Giant also published hits by R&B acts Color Me Badd, Jade, Silk, Chuckii Booker, Keith Sweat, Jeremy Jordan, Keith Washington and rap artist Shaquille O’Neal, and had several key cuts with Barry White and Whitney Houston. In 2002-2003, Kawashima worked as Creative Director at Sony/ATV Music Publishing in Los Angeles. 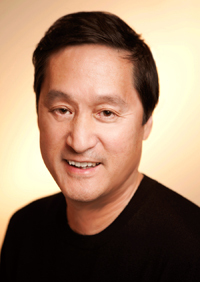 At Sony/ATV, Kawashima worked closely and represented many of the company’s top writer/producers, including Walter Afanasieff, Billy Mann, Marti Frederiksen, Cory Rooney. Jesse Harris, Sam Watters & Louis Biancaniello, Andrea Martin, Adam Anders and Jay Joyce. He also promoted Sony/ATV’s classic catalogs, including the Beatles, Babyface, Joni Mitchell, Cat Stevens, Stevie Nicks, and Billy Steinberg & Tom Kelly. Kawashima secured placements, and set up writer collaborations with Pink, Josh Groban, the Backstreet Boys, Natalie Imbruglia, Lit, Tamyra Gray, Evan & Jaron and many others. He also placed songs in the hit movies (and soundtrack albums), Maid In Manhattan and Barbershop. On the cover of Music Connection magazine (l-r): Tom Sturges, Linda Blum-Huntington & Dale Kawashima. From 2006-2012, Kawashima was Executive Director for HoriPro Entertainment Group, which is the U.S. division of HoriPro, a major Japanese talent agency, record label and music publishing company. HoriPro publishes worldwide the song catalogs of KISS, REO Speedwagon, Marilyn Manson, hits by Elvis Presley and the Byrds, Jerry Reed, Sophie B. Hawkins, Gram Parsons, and many country hits by George Strait, Lee Brice, Keith Urban, Reba McEntire and others. For HoriPro, Kawashima placed songs in films, TV shows, commercials and video games, and he also signed new artists and bands to publishing deals. One of the writer/artists he signed, Matt Palmer, released two albums in Japan and placed a song with Sony/Nickelodeon group, Big Time Rush. In 2013-14, Kawashima worked as an A&R Consultant with talented, young singer/songwriter Otis English. He set up writing collaborations for English and helped him secure a music publishing & artist development deal with hit writer/producers Evan Bogart & Eman Kiriakou. Bogart & Kiriakou have written & produced hits with Beyonce (“Halo”), MKTO (“Classic”), Hot Chelle Rae (“Tonight Tonight”), Jason Derulo (“It Girl”) and Selena Gomez (“Who Says”).